Roger Ebert's 'Jackass' Tweet: Right On Or Too Far? : The Two-Way Since he wrote on his Twitter page Monday afternoon that "friends don't let jackasses drink and drive," Chicago Sun-Times film critic Robert Ebert has been the center of controversy. He was referring to the death of actor Ryan Dunn. 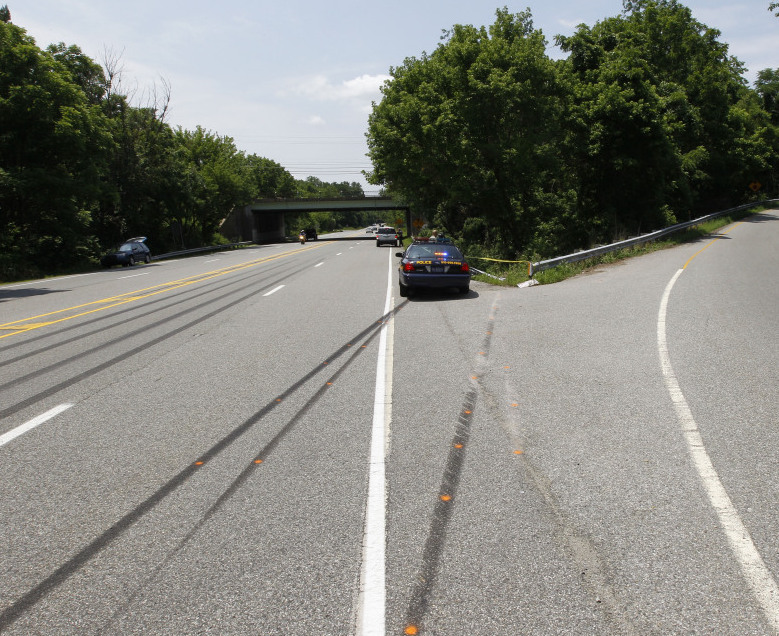 A police car sits near skid marks leading to where Ryan Dunn's Porsche went off the road Monday in West Chester, Pa.
"Friends don't let jackasses drink and drive"
... Chicago Sun-Times film critic Robert Ebert has been the center of some controversy. Ebert was referring to the death of actor Ryan Dunn, a featured player in the Jackass TV show and movies, who was killed in the early morning hours of Monday when the car he was driving flew off a road in Pennsylvania. A passenger, Zachary Hartwell, was also killed. According to Philly.com, "investigators said the car might have been traveling at more than 100 m.p.h. on a road marked for 55." Only a couple hours before the crash, a picture of Dunn with two other men — drinks in hand — was posted on the actor's Tumblr account and linked to from his Twitter page (both have since been removed). It isn't yet known if Dunn was intoxicated at the time of his death. Shortly after Ebert posted his message, celebrity blogger Perez Hilton called the tweet "extremely insensitive!" Jackass actor Bam Margera was livid. We can't post the profane message he put on Twitter in response to Ebert. You can click here to see it if you wish. Today, Ebert writes that he "was probably too quick to tweet" because not all the facts are in about Dunn's death. "That was unseemly." But he also notes that on Hilton's blog, "almost all" of the commenters "supported me."